While the East-West tunnel has got a lot of attention, another questionable transport project is lurking in the background. Every so often someone will take a look at cities with ferries and conclude that Melbourne needs them too, despite the radically different geography to somewhere like, for instance, Sydney or Brisbane. And they forget that for transport options to be useful, they need to provide not only speed and comfort, but also frequency. Frequency is critical. The current proposals getting airplay are from Werribee South (Wyndham Harbour) to either the city or Docklands, with some detail in these recent articles. The problem with both is that they purport to appeal to commuters, but neither stacks up with existing public transport from the area. Full trip to city Travel to wharf plus above; about an hour? Travel to wharf plus 40 minutes plus 15+ minutes on tram = about an hour? Travel to station plus 35 minutes = about 50 minutes? Some might think: Ah! All public transport is good public transport, right? Wrong. The cost and benefits need to be weighed up, just as with any project. The travel time is broadly comparable, presuming provided the bay isn’t too choppy (but hey, trains have delays too). The cost (of the proposal that’s revealed it) if you include the requisite tram/bus fare to get anywhere useful at the city end, is almost three times that of the train (plus bus and tram) fare. But what really kills it for commuters is the frequency. Every 40-60 minutes is not at all useful to people, particularly if coming from a connecting service. When leaving home in the morning you might be able to time the trip, but it wouldn’t work in the evening. Can you imagine the stress of trying to time your tram trip out of the CBD to catch the ferry, knowing a 40 minute wait to the next one if you miss it? This would be an utter failure for commuters. It might possibly work for tourists, who are less fussy about departure times and waiting around, but it’d need a lot of promotion to get people down to Docklands or Station Pier — apart from cruise ship arrivals at the pier, there wouldn’t normally be many tourists down there. And it’d need a bus connection to Werribee Park Zoo, as I’m assuming Wyndham Harbour itself isn’t much of a tourist attraction. The real concern with these ferry proposals, if they get up, is the cost to get them running. The second one is said to be without government subsidy (which probably explains the $22 fare), but it’s not clear if the first one might go ahead with some sort of subsidy. The cost of ferries, even a small fleet, could be huge. For both proposals, how much government money will go into Wyndham Harbour and other wharves to make them suitable for public ferries? In total, how much money is likely to be spent, and will it provide a service people will actually use? What is the cost per person likely to be? With infrequent departures, I can’t see many people using it for work travel. If millions gets spent upgrading wharf facilities, how many trains and buses (which could move another 800-1000 people) would that money have paid for? If we are serious about mass movement of people from the Werribee South and Point Cook areas into the city, without them being in their cars, shouldn’t we be giving them less flashy but more useful fast, frequent public transport? How about buses every few minutes to the station, along dedicated bus lanes (with traffic light priority) so they don’t get caught in traffic (which will build as the population grows), timed to properly meet the trains. And the trains of course should run more frequently (when RRL opens, capacity will be freed up for this) so the wait is never long and the journey’s not over-crowded. It’s really not that hard, but it does mean government should avoid getting distracted by expensive but flashy gimmicks we don’t need, such as cross-bay ferries. See also: Ferries and underground railways!! … But why? Initially a single ferry, capacity 350 (a bit less than half a moderate train load), from Werribee South to Docklands, taking 45 minutes (if they can get the river speed limit lifted) or 65 minutes (if not). Two departures each peak, presumably at least 90 to 130 minutes apart, depending on speed. To start next summer, and cost will be $25 return (so about 3.5 times the train fare when Melbourne two-zone fares are abolished from January). No mention of car parking or bus connections at the Werribee South end. And although it mentions the recent Wyndham to the City race, it doesn’t point out that the speedboat actually took marginally longer than most of the other participants from Point Cook: 1 hour and 13 minutes. The Age: Ferries to Melbourne’s west ‘not a priority, not viable’ — PTV advised the Coalition government that: a long-running concept to get ferries servicing a Werribee South-to-Docklands route was not advisable. This was because a five knot speed limit on the Yarra River made the final leg of the journey too slow. And a ferry service from Melbourne’s west would suffer from “large swells”, “cancellations and uncomfortably rough trips on a regular basis”, the advice said. They’re having another go at a Portarlington/Wyndham to Docklands ferry. Initially it would be Wyndham to Docklands. They’ve asked for the Yarra river 8 knot limit to be raised, and would aim for a 40-45 minutes travel time. Fare discounted at first, but eventually “less than $30 return”. They seem to see the competition as road, not rail (which costs $7.52 return). They say 2 departures per day initially (eg in the peak direction). Again, it’s very hard to see how this would catch on. 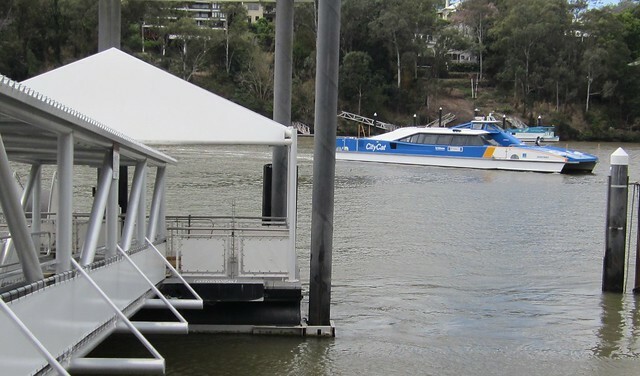 Plans are pushing ahead to trial a Wyndham to City ferry, with services beginning in May (probably the 16th). They haven’t overcome the issues I’ve raised above: it’ll be two trips per peak hour, taking about 70 minutes, costing at least $30 return. The best local comparison I can think of is “SuitJet”, a similarly-priced luxury commuter bus service launched in 2014, it was also hoping that a guaranteed seat and a comfortable ride would make up for it being less frequent, slower, and more expensive than trains. It failed within weeks of starting, and hasn’t returned. One can only wish them well, but I suspect this ferry will be a SuitJet of the sea. Next → Next post: Computer names… what’s next? You are spot on! The difference between you and the transport hierarchy is you actually use public transport and are aware of the realities. The people proposing ferries haven’t used public transport since their mum’s BMW 4WD was in for repairs and they had to catch the bus to (private) school. Portarlington to Docklands would take 60-80 mins on the direct ferry. Doing that journey by car or train takes 90 mins. So it should go ahead, IMO. The frequency would make or break the ferry service. They should develop a cross between a submarine and a ferry, so they can provide a semi-submerged service up and down the Yarra, under the low-clearance bridges. A Portarlington ferry has some merit. Maybe there should be one. Even a conventional ferry service along the Yarra, upriver of the CBD would be folly as land transport is faster and more direct. According to the PTV Journey Planner, bus/train from Portarlington to Southern Cross takes about 2 hours. Yes, looks like car/train (or car all the way) would be about 90 minutes. If the ferry is 80 minutes, I’d question its value. If it’s consistently 60, then it might be viable… but how many people travel from Portarlington to Melbourne every day anyway? Had a lateral thought a few hours ago that we might start with a 903 ferry between Altona and Mordialloc. Subsequent parallels are obvious and left as an exercise for the reader. I would like to see the whole list of boat projects given the go. However, you would need 15 to 20 minute frequencies. With development increasing right along the coast, there are bound to be a number of people of whom would be within 1 hour walking distance to these jetties. With some kind of ferry link bus service, it would be a toss of a coin for many people, do I take the train, or do I take the ferry. A ferry running along the shoreline is always going to be slower than a bus or a train running along the shore and travelling about the same distance. Where ferries are useful, is crossing bodies of water in a manner which is much shorter than driving around the body of water. A fast ferry from Portarlington or Portsea would make more sense, except there would not be enough people to make it viable. It is a chicken and egg situation. Would people move to Portarlington if they can get to Docklands in 60-80 mins? I have met people that live in Broadford, Cranbourne, Narre Warren, who commute daily to the CBD for work or study. So it is probable that some people will move house to Portarlington if a direct ferry service is provided. @Jacob, that’s true enough. Transport, at least to an extent, is supply driven… the same induced traffic principles apply whether it’s a new freeway or a new public transport service, such as a ferry… provided — as per the blog post, that it’s actually useable. 1-2 services a day may not cut it. And what is the subsidy involved to make it happen? I think bus service is not going to work as all it does is delay local traffic with too many big vehicles on the road. and so is ferry. The only way to improve traffic situation in point cook/werribbee is to have a new train line that services point cook, werribbee east … Williams landing station is in no man’s land. Driving there is a joke and people prefer going to laverton for zone 1 benefits. If that is too expensive, there should be an alternate to west gate bridge. I dont think any other solution besides these will work. Considering the ever growing population of point cook, it will be an investment well worth for generations to come although it might sound too expensive at the moment!! Have you traveled from Point Cook to anywhere during peak? It’s barely possible, the roads cannot handle anymore buses and there are nowhere near enough parking spaces at the three stations. Mind you, even if you finally got a park it would have taken you a considerable amount of time just to get there and find it. The ferry will be on the other end of point cook – against traffic and would reduce the load of the ‘Hundreds’ that travel to the city using the only exit out of point cook. We go from a suburb with one exit to two. I see your points and yes, it wont carry as many as train would in the same period of time but it will reduce the load on the freeway and exits which are at absolute capacity. If more busses are the solution then the roads will need to be widened, any changes to dedicate a bus lane will only impede on the rest exiting point cook. A tube or monorail seem to be the only other options…. @Andrew, thanks for your comment, great to have input from a local. Note that I said the buses should be in dedicated bus lanes. Throwing lots more buses into an existing traffic snarl doesn’t help anybody. Would people really use it in this kind of situation? Is there any precedent for this kind of thing in an Australian city? Thanks for the reply Daniel – I noted the dedicated bus lanes but that should only be done if duplication of the main arterial could occur. The reason why I would use it is because it would be quicker to get to, I would expect plenty of parking, and for $15 -$30 it would cost about the same as driving in and paying CBD parking rates. It would be a nice stroll across to the dock after work, if we had services every half an hour this should reduce the number of commuters exiting via other means. Yes, you have rightly stated it does come down to the frequency and one an hour just wont suffice. I’m sold at two an hour. 1. Not all of the proposed Bay Ferry services are the same – different services to different destinations within the Bay have different benefits and costs. While I’m not to familiar with the proposed Wyndham / Werribee ferry services which you state are not able to compete with other modes of transport available to commuters road / rail / bus to get in, out and around Melbourne. 2. However I note that other destinations such as Portarlington should considered a ferry as an alternative – as the car trip 1.5 – 2.0 hours and public transport options 2+ hour options are really sub-standard. Considering that Portarlington is less than 40 km to Melbourne across the bay and over 100 years ago we had a ferry service! 3. Before you can implement any Portarlington ferry service there needs to be substantial investment in the Pier which has been promised for years by various governments in the form of the Portarlington safe harbor proposal. This investment (if ever made) would hopefully provide terminals for the ferry service – but would also provide a safe harbor for vessels in the local area, additional infrastructure for both the local mussel industry and recreational boating. 4. I also note that any proposed Portarlington Ferry would provide little (if any) benefit for Melbourne commuters, but it would be provide a great service for the tourist industry and people who live and commute from the Bellarine to Melbourne – providing a viable service for a number of communities including; Portarlington / Indented Head / St Lenonards / Drysdale all of whom would be within a short drive of a ferry terminal. 5. While I note that you state that frequency of the service is important, for commuters in rural areas who are used to a 30+ minute wait for buses to connect to a train with another wait – I would think that this would not be an issue (especially if we had a direct service to a hub like Docklands in Melbourne). 6. Personally I commute from Portarlington to Melbourne on a semi-regular basis and while I agree that the PTV site shows a 2 hour trip the reality is that is on a good run when all the stars and planets are aligned – usually I’ll allow 2.5 hours (to account for a delay & missed connection). Going into Melbourne in the morning its not too bad – but the evening services (after 6:30pm) if you miss your bus in Geelong you have to wait about an hour for the next one. Don’t ask about the weekend. 7. While the population of the Bellarine may not big enough to justify the ferry service during the year – I’d bet that during the peak tourist season – Christmas / New Years / Easter that the service would be booked out. On this basis I’d suggest a tourist ferry with a few services operating to service regular commuters would be the way to optimise the use of the service at the least cost to the tax payer – which could also be priced into ticket options (i.e. premium price for one off use and discounts for regular use). 8. Furthermore I’d bet that the use of the service would grow over time. If Portarlington had better public transport to Melbourne there is no reason why people would not start to move to the Bellarine to live and commute to Melbourne over time – which I fear maybe a blessing & curse. 9. While the ‘wider benefits’ (tourist revenues / increased growth in population / aquaculture industry advancement / enhanced boating safety) all have some vested interests touting for a ferry service – which I fear involves some ‘creative accounting’ – I’d suggest that while the existing options for commuters are sub-standard, people will keep advocating the ferry service proposal. And one last thing I’d like to say is that this issue is kind of like Trams in Sydney – which were pulled out only for people to realize that there need to be different transport solutions for different problems – and now we see that light rail is making a comeback in Sydney….. so I’m not surprised that ferry services in Port Phillip Bay are again being discussed. The Portarlington ferry idea is being pushed by a group of people with strong ties, apparently, to property developers or at least some of the members of the ferry group have real estate interests in the town. While the idea of a ferry might be appealing to people work in the city of Melbourne or those who wish to make Portarlington in to a boutique seaside haven for the idle rich, the truth is Portarlington is and always has been very working class. I haven’t seen much discussion about how much the ferry trip would cost or how exactly the taxpayers of Australia should be asked to subsidise this ludicrous idea, or how the locals would be able to afford to use it. There is also the question of the reliability of such a service given that Port Phillip Bay can get rather choppy at times. I wonder if they will provide seasickness medication or vomit bags?